Congratulations to Rachel B. on winning the 2 piece stainless steel set from Eco Vessel. That’s an awesome prize Rachel! I think you’ll really enjoy the Boulder Bottle! Can you believe it? Only 5 more giveaways as part of our 25 Days series! Thanks to everyone for your participation and support through this series. I am so happy for everyone who has won prizes! Today’s prize is another awesome one from a company who has had presence here at Healing Cuisine in the past. Almost two years ago, I filled you in on my favorite whey protein brand, The Organic Whey. This is the best quality grass fed protein I have been able to find. I love the taste, but most importantly I love how pure and high quality the whey is. The Organic Whey protein powder is certified organic, from 100% grass fed cows, BGH-free, and gluten-free. Their whey protein is also free of food colorings, preservatives, sugar, additives, flavorings, and anything artificial. It is 100% organic whey protein powder. That’s it. No other ingredients added. And that’s why I love it so much. It’s so versatile! You can flavor it however you want in smoothies, or use it easily in baked goods without an overpowering vanilla/chocolate/berry flavor coming through. If you mix it plain with almond milk, or even water, it has a slightly sweet taste and tastes almost like milk. Dave finds it very enjoyable as is and will have that after his workouts. I prefer to shake it up with some Dynamic Greens and I’m good to go. Another unique point I need to make about The Organic Whey is the way they process it. They take great care in assuring the whey protein is kept as raw as possible. Of course in order for it to be sold legally, it must go through pasteurization. They do this at the lowest heat temperature possible to keep the proteins, fats, vitamins, and minerals intact through the minimal processing required by law. You can’t find this anywhere else! 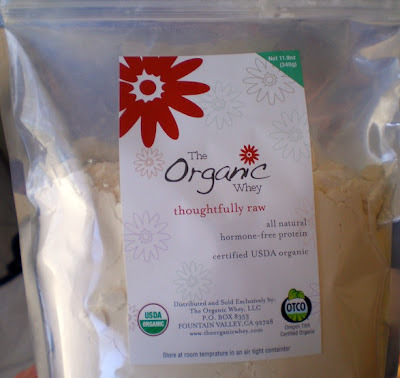 The Organic Whey is the rawest form of whey protein I have been able to find. And remember, raw is a good thing. You want to eat your food the closest to how God put it on the earth for you. You’ll probably find you can digest The Organic Whey more easily. And you’ll definitely notice a better taste! Pure product equals better taste every time! You can order The Organic Whey from their website or on Amazon.com. They recently introduced a new size – 1.5 lb bags. You’ll save money that way and it reduces waste! AND, they are hosting a giveaway of their own right now. If you sign up for their newsletter, you’ll have a chance to win a 6 month supply of The Organic Whey protein! There will be two winners selected! Enter to win a 12 ounce pouch of The Organic Whey protein! This giveaway will last 24 hours, from midnight EST on Thursday December 20th until 11:59pm EST the same day. Entering is easy! Simply follow the various options below in the Rafflecopter widget window. This The Organic Whey giveaway is open to continental U.S.A. residents only. There will be two winners. The winners will be contacted and confirmed within 48 hours after the giveaway ends. All entries are verified via Rafflecopter. We only have 5 days left of prizes! Be sure to come back tomorrow and EVERY DAY through December for a chance to win a new prize! You can win multiple times, so please don’t be shy to come back!